Having gone through the various stuff you get in the box and my initial impressions, it was time to get the bits put together and some adventuring done. Bob started assembling the “tiles” of the dungeon while I sorted out the many pieces that would track wounds and gold, act as items and so on. 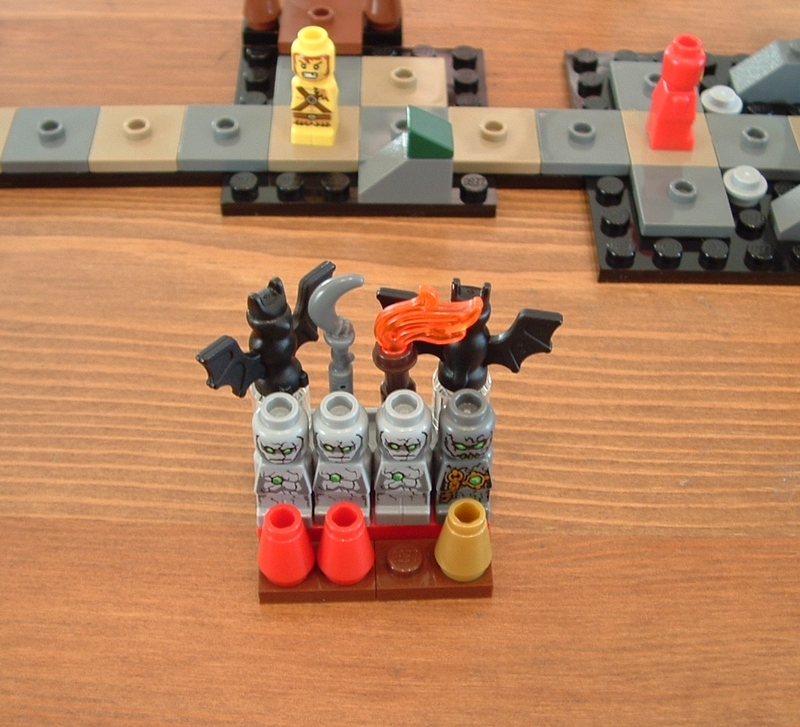 This photo shows us part way through with 4 “tiles” made, a weapon rack done (with gold in place to form a “bank”) and the flames inserted in the torches. At the bottom are what would, in most board games, be a player card to track their wounds and plunder. 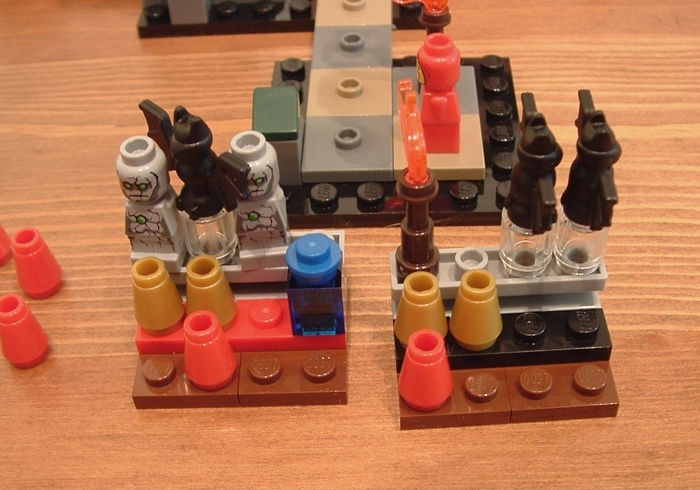 Here, of course, it is the same thing in Lego. Cunningly, the strip that holds each one together matches the colour of your adventurer: red for the wizard, a yellow barbarian (are they trying to tell us something?) and a black thief (racial profiling if ever I saw it). The red cones are for wounds. This is the first scenario ready to roll. Bob’s taken the thief and I’ve got the wiz. We start on the pale tile to the right, and have to get to the bottom left one with the green gem on a gold stick. Naturally there are bad guys that would prefer that this didn’t happen. Their lowest minions are mere bats, but the serious baddies seem to have some sort of skin problem (see below). The chap on the right is the biggest bad guy, which should be obvious from the amount of bling he has stolen from Mr T.
The dice you see in the pictures is a neat touch. 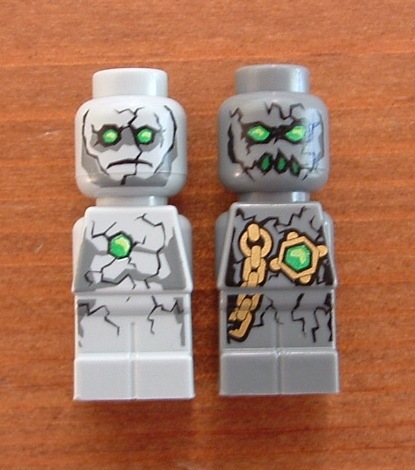 You assemble it with specific faces, and the different games in the Lego range use different faces. It’s a nice, big, chunky dice that feels solid and bounces about nicely thanks to the rubbery rim (sort of Lego tyre material). The dice is core to the game as interacting with anything requires a roll. Roll a dice to move, roll to fight, to clear a way past the rocks, see what’s in a chest, etc. These are all unopposed rolls, so there is no interaction with other players in a dice sense – it’s all just nicking the gold and gems the other guy wanted (plenty of that). If you end a move adjacent to an enemy, a pile of rocks, a treasure chest, etc – roll a dice. The result tells you whether you’ve won, lost or some hybrid result. It’s fast and simple with no calculations to make or opportunity to quibble. Here we are half way through the first scenario. In a two player game you both operate independently, racing to get to the objective at the end. Here you can see that we’ve taken different routes and that the sneaky thief has got a bit stuck fighting a bat. As has the wizard. If you lose a fight you lose one or more of your wounds and bounce back a space. If you lose all of your wounds then you aren’t knocked out. Instead you simply miss turns healing back a dice worth of wounds a go until you’re well enough to carry on again. Again, nice and simple. Incidentally, when you move you just move straight past other adventurers, so you can’t block each other in either. This all combines to make the game flow very quickly and smoothly, with no opportunities to upset each other (apart form the nicking of goodies I mentioned earlier). The final result was a victory for the wizard, though a pretty close one. These are the “player cards” for the two heroes we used. This shows that we’ve only got one wound left each (red cones), we have 2 gold each (gold cones), I have a potion (blue thing), and Bob has a torch. We carry our slaughtered foes with us in a Riddick-esque “you kill what you keep” style. The second scenario is all the same stuff assembled in a slightly different combination. To he honest, there isn’t a right lot of variation between the two. This is largely a result of the way the mechanics have been designed rather than the scenarios. The rules simply don’t allow for a lot of variation within a single set (without making extra things up). Of course, that was probably not the key aspect of the design brief. I decide to call the wizard “Dozer” as every time he comes to a pile of rocks he just goes straight past first time. The barbarian is having trouble with these too. By the end of the scenario I have killed almost everything. You can see that the barbarian isn’t far behind me, but look at those bodies! Finally, when you’re done, break down the board into the separate “tiles” and bung it all back in the box. 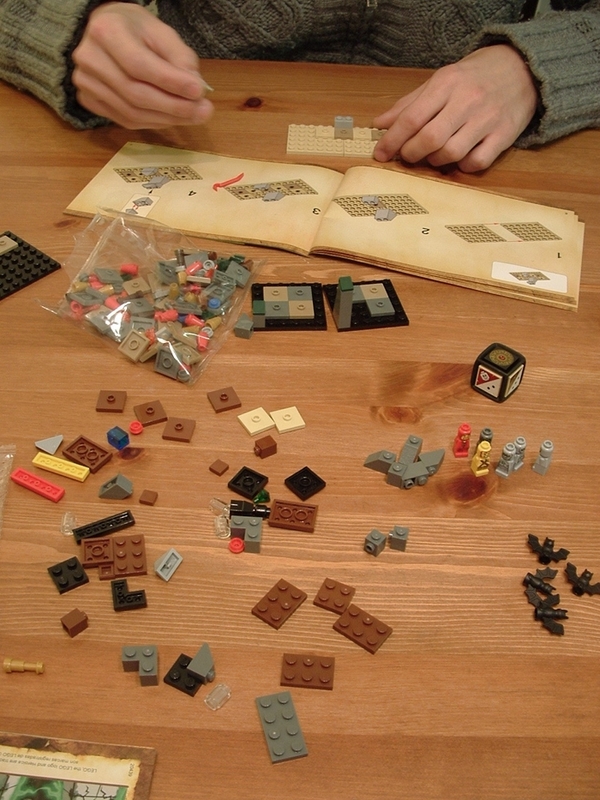 It all fits nicely and will only take 2 minutes to reassemble next time you play (see below). So what do I think? Well we played it as total of 3 times and after the initial assembly it took perhaps 15 minutes a game. It’s slick and simple, and although it is designed for kids I can see this filling a couple of gaming niches very nicely. Filler: either as a warm up for a bigger game, while you’re waiting for Frank to turn up, or at the end of a session – there are always times when you need a simple, fast game that will occupy people for quarter of an hour. You need something light and quick to set up/explain as well as play. Nothing that’s going to create analysis paralysis either. I’m thinking things like Nuclear War, for example. This is perfect. Non-Gamer Friendly: once in a while you’ll want to play a game with a non-gamer or three. The archetype of this (in the UK) is a Christmas game of Monopoly with uncles and aunties. Typically this will not get finished as people will either fall out or get bored hours before it is finished. 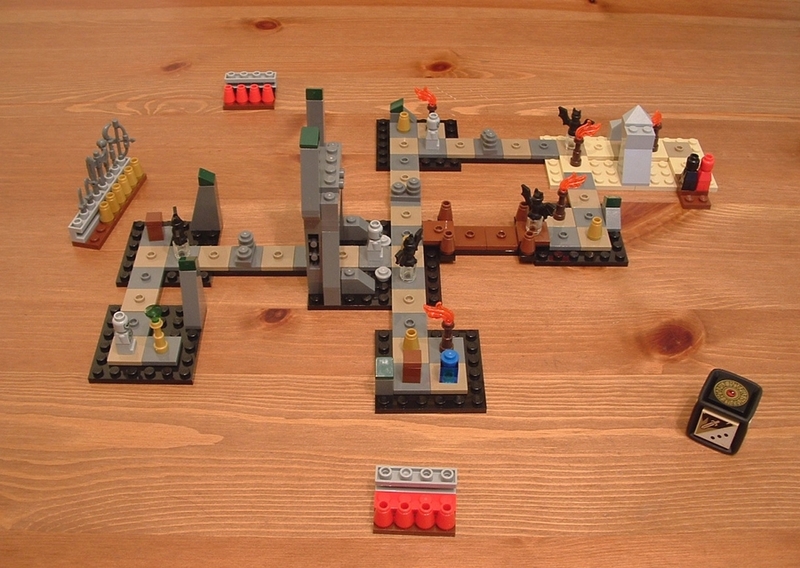 Heroica would be perfect. 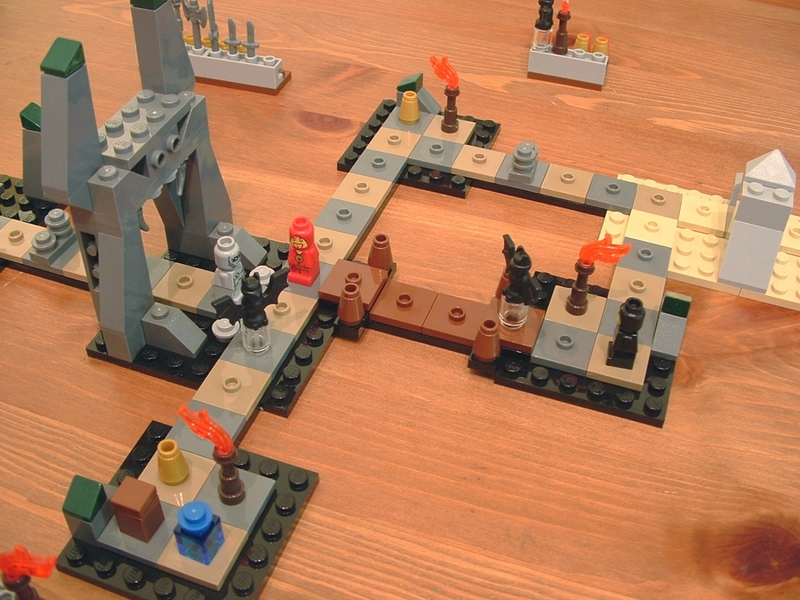 In fact, I’d go as far as to say that Heroica would be the best game I can think of in many ways. I have lots of cuddly-themed Euro games on my shelves, but they’re all proper games, and my family know I’m a gamer so it’s a bit intimidating. Lego, on the other hand, well, everyone knows Lego. It’s entirely unintimidating. There’s more. This game has 3 heroes, so you can play with 3 players. However, it also gives you rules for someone playing the bad guys, which effectively makes it a 4 player game. This would make the interaction completely different, and may even encourage the adventurers to cooperate a bit. I haven’t played this, but it looks like it’d be a lot of fun and would still take under 30 minutes. I’ll be arranging a game of this when I can. Another good, light filler. One other thing I almost forgot. This is the Nathhuz adventure of the Heroica series. There are (I think) 4 sets all told, and they not only work as stand alone games, but can be joined together to form a huge dungeon. That would be worth trying with a few folk. So is it too simple? No, I don’t think so. As long as you take it for what it is rather than a replacement for Dwarf King’s Hold, Descent, D&D and the like. They’re all more involved and require far more cunning and strategy. Heroica is a light romp to fill a few moments at either end of a gaming session (or a game to play with your kids/in-laws), and as that it’s great. 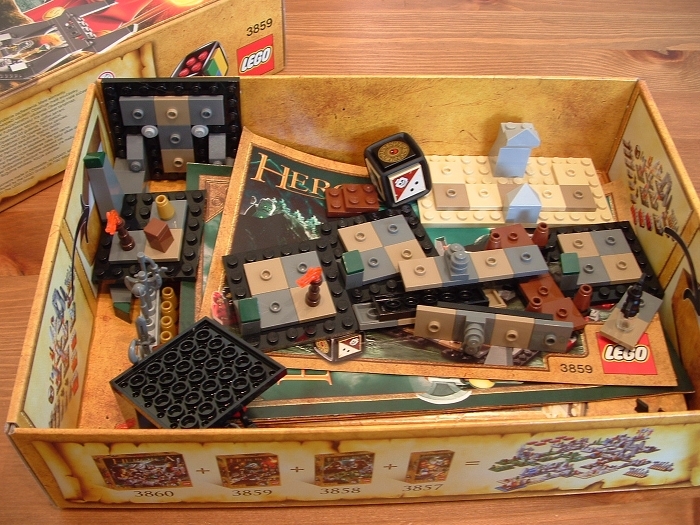 My family and I have loved Heroica since it came out. All of them are a blast. We’ve started incorporating new rules, like Hero Quest style stuff, where you can’t see what’s in each room and it “reveals” itself when you enter it. This requires a Dungeon Master playing the dungeon and baddies, but it’s a blast. You’re right, it’s such a simple system that it would be easy to add all manner of things, and I’m sure people will. I’ve already been sent one set of “advanced rules”, and there are probably more if you look. These are, perhaps, more useful if you’re playing with children or non-gamers as a way of ramping it up and giving them the fun of tinkering rather than for a group of hard-bitten gamers. In that case there are other games which may well already scratch the itch of more detailed dungeon crawls. 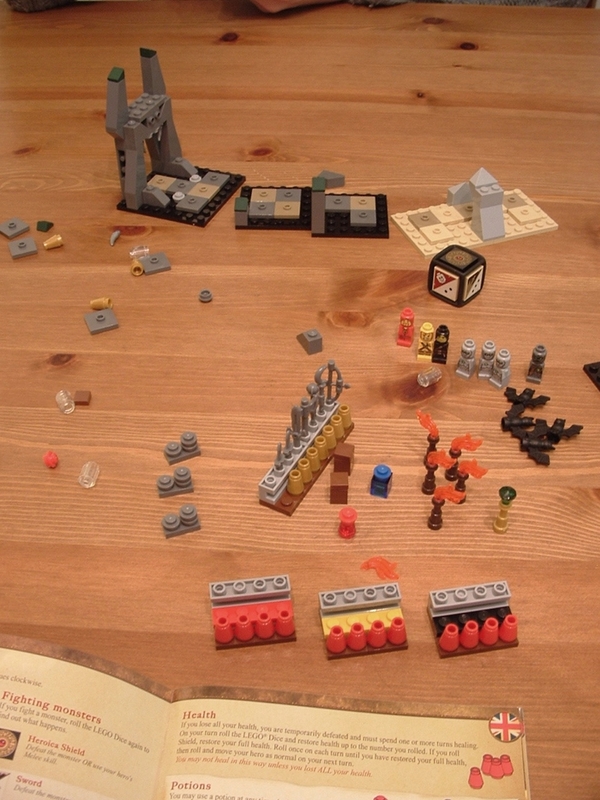 We’ve been playing a bit of Creationary as a party game – basically Lego pictionary. It’s fun – the rulebook says “here are some rules, but make up your own”. Same deal with Heroica? Well, it comes with a set of rules, but it also tells you to make up your own. And still, many do not heed it ;). After doing so, I have to agree with you, it’s pretty good fun, especially for a game costing £11. Looking forward to getting the other sets now so I can make one massive dungeon and create some extra rules. 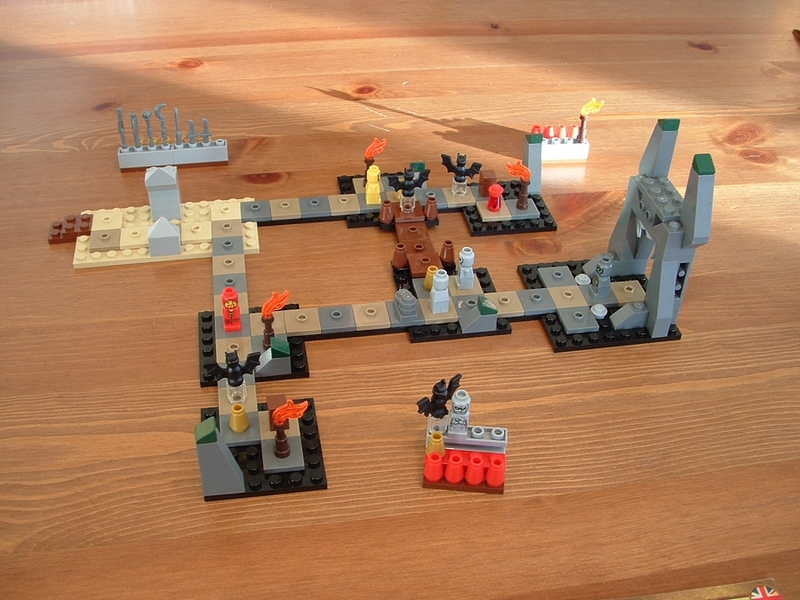 I have a recently-turned-five year old…he LOVES Heroica (“Lego game!”). As an intro to dungeon bashing and gaming in general it is absolutely perfect. It says 8 on the box iirc, but he understands perfectly. He’s especially fond of the rogue and insists on whacking any enemies he beats with one of the little model daggers. We also loved building it all. He’s getting the biggest set (the last one we don’t have) for Christmas. Highly recommended for anyone with kids of 4 and up. My wife and I bought this to try and encourage our 8 year old autistic son away from his computer. It’s short enough to play without him getting bored, simple enough for him to not feel overwhelmed by the rules,a nd the 3D element helped capture his (sadly lacking) imagination (i’m not being mean, lack of imagination is a trait of ASD). When we’d finished he immediately asked to play it again, and remembering the look from my wife after seeing our son finally choosing to interact with his family still makes me smile.